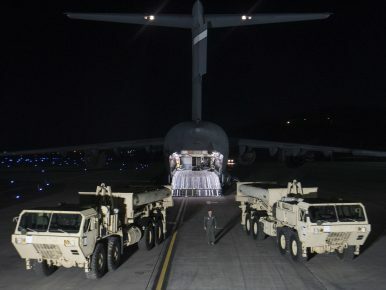 The United States deployed the first elements of the so-called Terminal High Altitude Area Defense (THAAD) system in South Korea on March 6 in response to recent North Korean nuclear weapons tests and ballistic missile launches, U.S. Pacific Command announced in a statement yesterday. THAAD is an anti-ballistic missile system capable of intercepting incoming ballistic missiles in the terminal phase, i.e. during the descent phase of flight. The system is specifically designed to destroy short- and medium-range ballistic missiles at endo- and exo-atmospheric altitude up to heights of 90 miles. The hypersonic interceptor missile fired by THAAD can travel at speeds of over Mach 8. The missile relies on infrared seeker technology to hone in on its target and then destroys it using kinetic energy — like hitting a bullet with a bullet. “In plain English, missile meets missile in mid-air; both missiles go ‘Boom,'” as The Diplomat explained elsewhere. However, what troubles the People’s Republic of China is not so much THAAD’s interceptor missiles but its surveillance capabilities, in particular the powerful AN/TPY-2 X-Band radar system, a transportable X-band, high-resolution, phased-array radar developed by U.S. defense contractor Raytheon. While the United States already operates a THAAD system in Guam, and has deployed two AN/TPY-2 radar systems in Japan, it is THAAD’s interoperability with other ballistic missile defense systems (e.g., Aegis-equipped destroyers) and its ability to share early tracking data of Chinese ballistic missiles that make Beijing uneasy about the stationing of the AN/TPY-2 X-Band radar system so close to the Chinese border. As The Diplomat explained elsewhere, it is not clear how much of an impact an additional radar unit would have on China’s ability to successfully launch intercontinental ballistic missiles. Nevertheless, U.S. Pacific Command’s statement that “the THAAD system is a strictly defensive capability and it poses no threat to other countries in the region” will do very little to assuage Chinese concerns.